In May's issue, ANIMEfringe would like to help you find yourself. 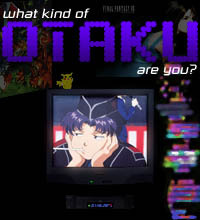 We think it's time you find out what kind of otaku you really are! Check out our Cover Story to find out. And how would you like to see a few turbocharged anime music videos set to some heart-pounding electronic music? Read our spread on Animetronic to learn more about it. In any case, enjoy! Cover Story: What kind of Otaku are you? Did you know that there are roughly 6 general types of Otaku wandering around the world? And those brave, wonderful people at ANIMEfringe have devised, for your enjoyment, a 20-question survey to determine just what kind of Otaku you are. Information that could save your life! Read on to find out! On April 23 it became apparent that the former leader in the quest to bring the latest Anime news to the World Wide Web, the Anime News Network, was down for the count. Just a week after announcing one of the most eagerly-anticipated announcements concerning Sailor Moon's bright future in the English market, ANN quietly disappeared behind a plain white page reading "disabled index." Signs of trouble were hinted two weeks prior, when news stories were not posted regularly. On the week of April 17th, the Editor-in-Chief posted an editorial about how he had let down the anime community by letting the news stories lapse. Follow-up story: On May 1st, the Anime News Network was brought back from the cyber-void it had fallen into. The stories from April 17th were still present, thought no new articles had been added. It is unclear at this time as to what caused ANN to go offline. In March, ANIMEfringe announced that the series Nanako Kaitai Shinsyo, an OVA about an ordinary high-school student who must take a job as a Nurse to help with her parent's mounting debt, was tentatively titled Bionic Nanako. Now, according to July solicitations in Previews Magazine, the series has the official title of "Amazing Nurse Nanako." The 16-and-up rated, first volume Amazing Nurse Nanako Volume 1: 'Doctor Is Out' is expect in stores in July on VHS subtitled and dubbed and Bilingual DVD. 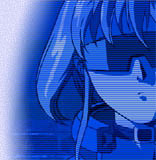 In other related news, the re-release of the two 3x3 Eyes OAV series is nearly complete. The first volume, 3x3 Eyes: Immortals will feature the fully subtitled and re-dubbed first four episodes in a two-tape boxed set with gatefold slip-sleeve packaging. Though the first volume will only be released on VHS subtitled and dubbed, a DVD box set which will contain both OAV series will be released at the same time or shortly after the VHS release of the 2nd OVA series, which is still in production. Inside sources reveal, "...some really great voice and directing talent on Nanako & 3x3 Eyes. Including such name actors as Keith David, Brigitte Bako, Christian Campbell, Bill Faggerbakke and many more."